Gluten-free ingredient • Flour made from almonds  which are rich in fiber, protein and antioxidants  is gaining in popularity. Kim Raff | The Salt Lake Tribune Lisa Barker, the outreach and education coordinator for Honeyville Grains, makes chocolate chip cookies using almond flour at the company's Salt Lake City store. 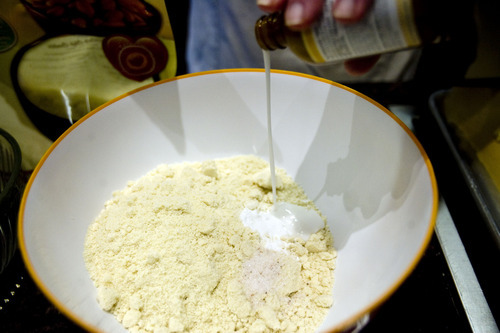 Francisco Kjolseth | The Salt Lake Tribune As more people turn to a gluten-free diet, almond flour, like the version sold by the Utah-based Honeyville Grains, is becoming more popular. Francisco Kjolseth | The Salt Lake Tribune As more people turn to a gluten-free diet, almond flour, like this version sold by the Utah-based Honeyville Grains, is becoming more popular. Kim Raff | The Salt Lake Tribune Lisa Barker, the outreach and education coordinator for Honeyville Grains, makes chocolate chip cookies using almond flour at the company's Salt Lake City store. Kim Raff | The Salt Lake Tribune Lisa Barker, the outreach and education coordinator for Honeyville Grains, mixes chocolate chip cookies using almond flour at the company's Salt Lake City store. 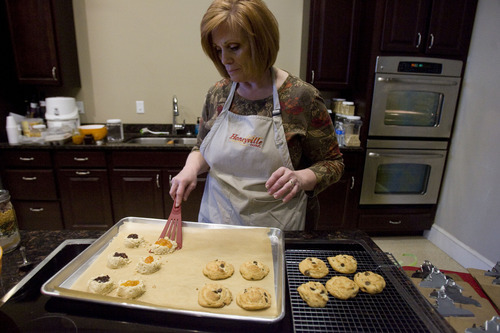 Kim Raff | The Salt Lake Tribune Lisa Barker, the outreach and education coordinator for Honeyville Grains, makes chocolate chip cookies using almond flour at the company's Salt Lake City store. 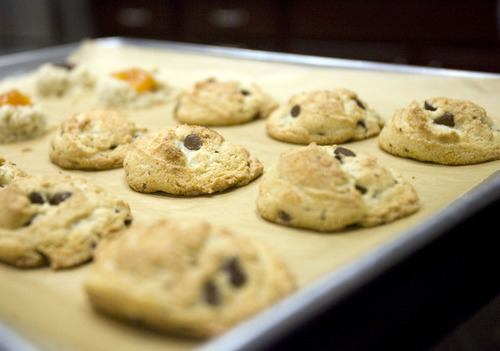 Kim Raff | The Salt Lake Tribune Freshly baked chocolate chip cookies made with almond flour at the Honeyville store in Salt Lake City on March 4, 2013. Kim Raff | The Salt Lake Tribune Lisa Barker, the outreach and education coordinator for Honeyville Grains, makes cookies using almond flour at the company's Salt Lake City store. Kim Raff | The Salt Lake Tribune Freshly baked thumb print cookies made with almond flour at the Honeyville store in Salt Lake City on March 4, 2013. Colleen Sherratt may have been one of the first Utahns diagnosed with celiac disease, the condition in which the body can&apos;t process gluten. That was in the late 1950s, and once the then 28-year-old figured out why she had lost 20 pounds and felt sick to her stomach, she had few alternatives to eating wheat, which contains the problematic protein. "I didn&apos;t bake anything, cookies, cakes, breads," the now 83-year-old recalls. Today, gluten-free products are everywhere. And baking delicious cookies and cakes is not a problem  thanks in part to Sherratt&apos;s family business. Her husband, Lowell, is the president of Honeyville Grain, with corporate headquarters in Brigham City. In addition to processing and selling loads of wheat flour, it also sells gluten-free flours including soy, rice, corn, potato and almond flour (also known as almond meal). It&apos;s the almond flour that Honeyville is becoming known for in the gluten-free world. The company has been selling it for about seven years, but business started booming recently as the diet restriction moved beyond just those with celiac disease and less-extreme gluten sensitivities to the mainstream. Chris Ondatje, vice president of Honeyville&apos;s e-commerce division, says almond flour is the company&apos;s Number 1 online seller. They&apos;ve sold about 400,000 pounds of it in the last year, a 100 percent increase from a year ago. "Sales growth remains hot," Ondatje wrote in an email. "It&apos;s so sought after that we&apos;re constantly fighting to stay ahead of the demand curve." Big business • Gluten-free food is an estimated $4 billion to $6 billion food industry, and projected to keep expanding, according to the market research company Mintel. The growth is attributed to trendiness  a perception among shoppers that they&apos;ll lose weight without gluten  and the improved taste of gluten-free products. And as more Americans experiment with a grain-free diet  another trend highlighted by The Hartman Group, a Washington-based research and consulting firm they&apos;re seeking nut meals. Almond flour, which is finely ground almonds, is healthier than the other wheat-alternatives, says Diane Bell, owner of the Taylorsville shop Against the Grain, which sells gluten-free baking mixes and baked goods. "White rice and brown rice flour has one gram of fiber. Big whoopie," she says. But one serving of almond flour has 6 grams of protein, compared to 3 grams in wheat flour. It also has fewer carbohydrates but more fiber and healthy unsaturated fats, which protect the heart. Almonds are also cholesterol free and pack the antioxidant Vitamin E.
"Everybody in the general population can benefit from it," Bell said of using gluten-free flours. "We try to teach people to alter and vary [the grains they eat] so you don&apos;t become sensitive to any other products." Best for baking • Almond flour is best suited to sweets: cookies, cakes, muffins and pancakes, says Lisa Barker education and outreach coordinator at Honeyville. The company occasionally offers gluten-free cooking classes at its four retail stores, including ones in Salt Lake City and Brigham City. Barker&apos;s family isn&apos;t gluten-free, but she says she cooks with almond flour every week or so. 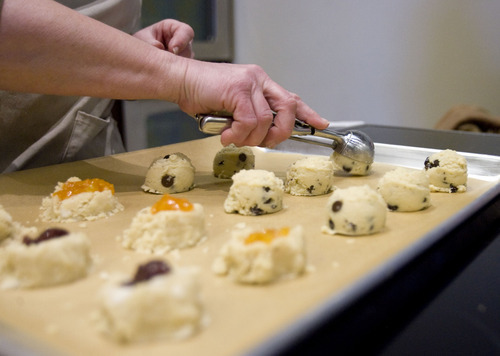 "It adds a delicacy," she said recently while making cookies in Honeyville&apos;s Salt Lake City demonstration kitchen. "The [gluten-free] muffins used to be these ugly little things. Now you can make these pretty muffins that have flavor and texture and beauty to them." The food won&apos;t taste the same as if it were made with wheat flour. But the almond pancakes taste nutty and the chocolate chip cookies were moist and dense. Debbie Deaver, of Salt Lake City, created what she says is the largest gluten-free expo in the country. She expects 8,500 people and 200 vendors to attend her event this year in Sandy. When she bakes, Deaver uses coconut to make her almond-based desserts stick together. Other cooks use xanthum gum or guar gum to bind the ingredients. "I prefer the taste" of almond flour, Deaver said. "I&apos;m getting more intolerant to grains. I&apos;m trying to stay away from anything that&apos;s corn or grain-based. Almond flours help me with that." 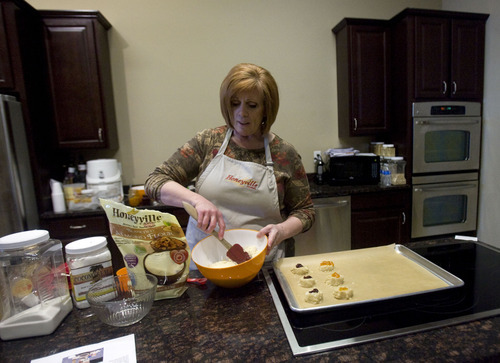 Ali Regan, owner of the gluten-free Sweet Cake Bake Shop, in Kaysville and Salt Lake City, adds almond meal to her specially-designed flour mixes for the protein and fiber it adds, as well as for the moisture and "mouth feel" it creates. And for sweets, it tastes better than a bean-based flour that would leave a cookie tasting like garbanzo. "I love, love, love almond meal," she said. "It&apos;s a go-to source." She said it takes some experimentation and skills when using almond flour, unless the recipe is made for the nut. Barker said it&apos;s worth experimenting. "This is an opportunity  just like a chef is looking for new products to play with." Cost • A 5-pound bag of Honeyville blanched almond flour is $31.88. The company also sells natural almond flour, which includes the nut skins. 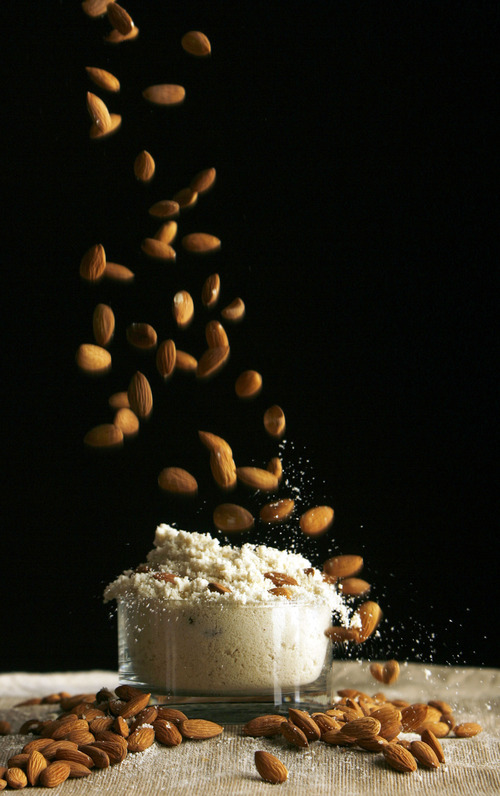 DIY • You can make your own almond meal, by grinding up almonds in a food processor. 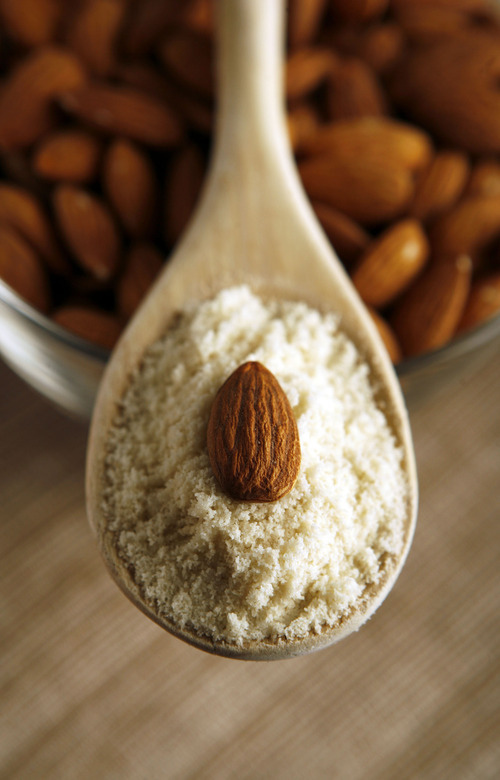 Shelf-life • Almond flour lasts three to six months, according to Honeyville. But it can be frozen or refrigerated to use later. Heat oven to 375 degrees. Mix softened butter, sugars, and egg together until smooth. Add salt, vanilla, baking soda, and then almond flour. Mix until all ingredients are incorporated. Stir in chocolate chips. With a dinner spoon and spoon balls of dough onto a greased baking sheet. Bake 12 to 15 minutes or until golden brown on top. Remove and let cool on the pan for 2 to 3 minutes. Remove from pan and cool completely on a rack. Serve immediately or store in an airtight container. In a small bowl, combine almond flour, salt and baking soda. In a medium bowl, using an electric mixer, mix melted coconut oil, maple syrup and vanilla. Slowly add dry ingredients, and continue to mix until thoroughly combined. Cover and chill dough in refrigerator at least one hour or up to two days. Once dough is chilled, heat oven to 350 degrees. 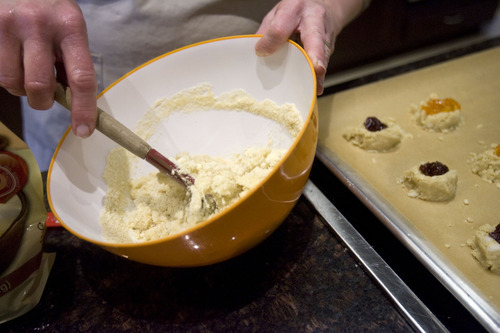 Scoop out tablespoon-size portions of dough and roll into balls using your hands. 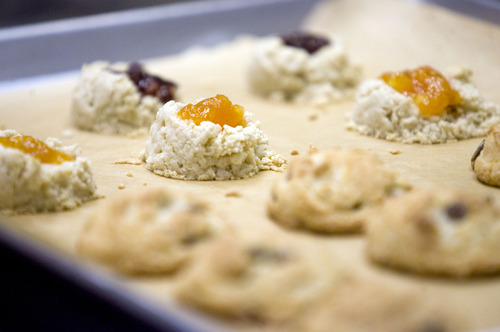 Place cookie balls onto a parchment-lined baking sheet and slightly flatten using the palm of your hand. Using your thumb or a 1/4-size teaspoon, gently press each cookie to form a small well in the center to hold the jam. Add a small dot of jam in the center of each cookie. Bake for 8 to 10 minutes, or until cookies begin to slightly brown along edges. Allow to cool on baking sheet for a few minutes; then transfer to a wire rack to finish cooling. These cookies are best served within an hour of baking since almond flour cookies tend to soften as they sit at room temperature. They can be reheated a parchment-lined baking sheet in a 195 degree oven for 6 to 10 minutes. Heat oven to 350 degrees. Line a muffin tin with 12 paper liners or grease and flour a 5 x 8-inch bread pan using almond flour. In a medium mixing bowl, combine flour, soda and salt. Using an electric mixer or wire whisk, combine oil, agave and eggs. Mix well. Add in vanilla and almond extract. Add Greek yogurt and mix well for 1 to 2 minutes. Mix in lemon rind and poppy seeds. Slowly add dry ingredients into wet ingredients, mixing well. Pour batter into muffin tin, filling halfway, or into bread pan. Bake muffins 20 to 25 minutes, or bread for 30 to 35 minutes, until lightly brown and a toothpick inserted in the center comes out clean. Whisk egg in a large bowl or liquid measuring cup. Mix in the almond flour and salt; add enough cream to get a good pancake batter consistency and mix well. Heat a tablespoon of butter in a small frying pan on medium high. When the butter begins to foam, spoon about 1/4 of the mixture into the center of the pan and spread out to about 4-inch diameter; continue to cook for a minute or so until the edges look dry. Carefully flip and cook for another minute until set. Serve with maple syrup and fresh fruit.